Chemical bond is the term used to describe the linkages between atoms joined together to form molecules or crystals. Chemical bonds are the result of electromagnetic interactions that may be either electrostatic or electrodynamic in nature or a combination of the two. Electrostatic bonding forces result from coulombic attraction or repulsion between charged particles whereas electrodynamic bonding forces result from the sharing of electrons and are described by quantum mechanical theories of the valence bond and of molecular orbitals. Chemical bonding is categorized within five different classes of chemical bonds: Ionic, covalent, coordinate covalent, metallic, and hydrogen. Actual bonds may have properties that aren't so discretely categorized, so a given bond could be defined by more than one of these terms. Chemical bonding theory explains one aspect of the relational nature of physical existence and mimics in some ways the essential nature of bonds holding people together in families, groups, societies, or nations. In the formation of a chemical bond between two atoms (or ions), for example, each of the two relinquishes a part of its energy of autonomous existence as a contribution toward the energy of the chemical bond formed between them. As a consequence, the two bound entities each exist with a lower individual energy than when they were autonomous and the bond is stable. Similarly, two people interacting harmoniously are naturally bonded and may feel themselves buoyed by the relationship, as though their existence requires less energy. Conversely, separating two chemically-bonded atoms (or ions) requires the input of enough energy to return to each entity energy sufficient for autonomous existence. Likewise with harmoniously bonded people, an input stronger than the bond between them is needed to break their relationship. 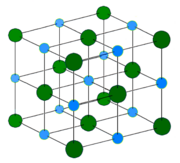 The Sodium Chloride Crystal Structure is an example of a crystal lattice held together by electrostatic forces. Each atom has six nearest neighbors, with octahedral geometry. This arrangement is known as cubic close packed (ccp). The ionic bond refers to the electrostatic forces holding the ions together, but not collapsing together, in an ionic solid. Ionic solids are electrically neutral and contain both cations (positively charged ions), and anions (negatively charged ions). These ions are held together in an ordered three-dimensional array, a crystal lattice, by coulombic attractive forces acting between the net positive or negative charges on the ions and by repulsive forces associated with the electron shells of each ion. The lattice arrangement means that each positive ion is surrounded most closely by negative ions and each negative ion is surrounded most closely by positive ions. In this way, the lattice minimizes the repulsive forces between the similarly charged ions and maximizes the attractive forces between the oppositely charged ions. While ions in principle can be monatomic or polyatomic, the ions in most crystals are monatomic. The formation of an ionic bond is exemplified in the reaction between the metal, lithium, and the non-metal, fluorine. Metals loose electrons to form cations, and non-metals gain electrons to form anions. The resulting ionic solid is held together by ionic bonds formed due to the electrostatic forces acting between charged ions. In this example, lithium has one valence electron, which is held rather loosely and is easily lost. Fluorine has seven valence electrons and it tends to gain one electron in order to give a stable octet of electrons. If the electron moves from lithium to fluorine each ion acquires the stable electronic configuration of a noble gas. The bonding energy (from the electrostatic forces acting within the crystal structure) is large enough that the net energy of the bonded ions is lower than their collective energy in the unbonded state. Reactions that form ionic crystals occur only if the overall energy change for the reaction is favorable (the bonded atoms (or ions) have a lower energy than the free ones). The larger the energy change the stronger the bond because the energy lost by the atoms (or ions) is imparted into the energy of the bond itself. The electrostatic forces acting within an ionic solid are quite large. Such bonds are stronger than hydrogen bonds, but similar in strength to covalent bonds. Consequently ionic solids have relatively high melting points and boiling points. At the same time, however, many ionic solids are water soluble because the ions are readily attracted by water's polar molecules. In the solid state, ionic solids do not conduct electricity, as the ions are fixed in place and their electrons are securely bound to each of the ions. When ionic solids are melted or dissolved in water, the ions are free to move and in these states ionic compounds conduct electricity via the movement of ions themselves rather than of electrons. 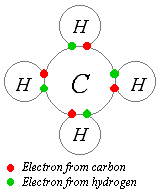 Covalently bonded hydrogen and carbon in a molecule of methane. One way of representing covalent bonding in a molecule is with a Lewis diagram. Covalent bonding is a form of chemical bonding characterized by the sharing of one or more pairs of electrons between two atoms, producing a mutual attraction that holds the resultant molecule or polyatomic ion together. Atoms tend to share electrons in such a way that their outer electron shells satisfy the octet rule. Such bonds are always stronger than the intermolecular hydrogen bond and similar in strength to or stronger than the ionic bond. Covalent bonding most frequently occurs between atoms of non-metals with similar electronegativities. In contrast, metals with their easily-removed electrons being somewhat free to roam in the material are more likely to form metallic bonds when confronted with another species of similar electronegativity. However, covalent bonding in metals and, particularly between metals and organic compounds is particularly important, especially in industrial catalysis and process chemistry, where many indispensable reactions depend on covalent bonding with metals. The idea of covalent bonding can be traced to Gilbert N. Lewis, who in 1916 described the sharing of electron pairs between atoms. He introduced the so called Lewis Notation or Electron Dot Notation in which valence electrons (those in the outer shell) are represented as dots around the atomic symbols. Pairs of electrons located between atoms represent covalent bonds. Multiple pairs represent multiple bonds, such as double and triple bonds. Some examples of Electron Dot Notation are shown in the figure to the right. In this diagram bond-forming electron pairs are represented as solid lines. Bond order is a number used to indicate the number of pairs of electrons forming covalent bonds between two atoms. The most common type of covalent bond is the single bond, the sharing of only one pair of electrons between two atoms. All bonds involving the sharing of more than one shared pair between two atoms are called multiple covalent bonds. The sharing of two pairs is called a double bond and the sharing of three pairs is called a triple bond. An example of a double bond is the carbon—oxygen bond in carbon dioxide (see diagram at right), and an example of a triple bond is the carbon—nitrogen bond in hydrogen cyanide (HCN). Quadruple bonds, though rare, also exist. Both carbon and silicon can theoretically form these; however, the formed molecules are explosively unstable. Stable quadruple bonds are observed as transition metal-metal bonds, usually between two transition metal atoms in organometallic compounds. Molybdenum and Ruthenium are the elements most commonly observed with this bonding configuration. An example of a quadruple bond is also found in Di-tungsten tetra(hpp). Quintuple Bonds are found to exist in certain chromium dimers. Sextuple bonds of order 6 have also been observed in transition metals in the gaseous phase at very low temperatures and are extremely rare. Other more exotic bonds, such as three center bonds are known and defy the conventions of Lewis structres. It is also important to note that bond order is an integer value only in the elementary sense and is often fractional in more advanced contexts. Some structures, such as ozone, O3, can have more than one valid Lewis Dot Structure (LDS). In an LDS diagram of O3, the center atom will have a single bond with one atom and a double bond with the other. The LDS diagram cannot tell us which atom has the double bond; the first and second adjoining atoms have equal chances of having the double bond. These two possible structures are called resonance structures. In reality, the structure of ozone is a resonance hybrid between its two possible resonance structures. Instead of having one double bond and one single bond, there are actually two 1.5 bonds with approximately three electrons in each at all times. A special resonance case is exhibited in aromatic rings of atoms (for example, benzene). Aromatic rings are composed of atoms arranged in a circle (held together by covalent bonds) that are conceived with LDS as alternating between single and double bonds. In actuality, the electrons tend to be delocalized and evenly spaced within the ring. Electron sharing in aromatic structures is often represented with a ring inside the circle of atoms. When a covalent bond forms between two atoms of differing electronegativity the more electronegative atom draws the shared bonding electrons toward itself. This results in a separation of charge along the bond. The less electronegative atom will bear a partial positive charge and the more electronegative atom will bear a partial negative charge. In this situation the bond has a dipole moment and is said to be polar. This is sometimes seen as a mixing of ionic and covalent character in the bond with the bonds having greater polarity being the bonds with a greater amount of ionic character. Thus the ionic bond and the non-polar covalent bond represent the two extremes of a spectrum of bonding types. While the idea of shared electron pairs provides an effective qualitative picture of covalent bonding, quantum mechanics is needed to gain deeper insight into the nature of these bonds and predict the structures and properties of simple molecules. Walter Heitler and Fritz London are credited with the first successful quantum mechanical description of a chemical bond, specifically that of molecular hydrogen, in 1927. Their work was based on the valence bond model, which assumes that a chemical bond is formed when there is good overlap between the atomic orbitals of participating atoms. (Atomic orbitals are mathematical functions describing the wave-like behavior of electrons in an atom.) In valence bond theory, molecular geometries are accounted for by the combining of normal atomic orbitals to form hybrid atomic orbitals having specific bond lengths between atoms and specific angular relationships between different bonds. The valence bond model is supplemented with the molecular orbital model. In this model, as atoms are brought together, the atomic orbitals interact to form molecular orbitals that extend between the two bonding atoms. These molecular orbitals can be mathematically constructed through a linear combination of atomic orbitals in LCAO theory. Using quantum mechanics it is possible to calculate the energy levels, bond angles, bond distances, dipole moments, and frequency spectra of simple molecules with a high degree of accuracy. Currently, bond distances and angles can be calculated as accurately as they can be measured (distances to a few pm and bond angles to a few degrees). For the case small molecules, energy calculations are sufficiently accurate to be useful for determining thermodynamic heats of formation and kinetic activation energy barriers. A coordinate covalent bond (also known as dative covalent bond) is a special type of covalent bond in which the shared electrons come from one of the atoms only. Once the bond has been formed, its strength is no different from that of a covalent bond. This type of bond forms when a Lewis base (an electron donor or giver) donates a pair of electrons to a Lewis acid (an electron accepter) to form a covalent bond. The product of this type of reaction is called an adduct or a complex. To function as the Lewis base an atom in a compound must contains a lone pair of electrons that it can donate. To function as a Lewis acid the compound must be able to receive the pair of electrons. In order to receive electrons the Lewis acid can be electron deficient (see article octet rule), have a partial positive charge or be a metal ion in solution. One simple system is the reaction of ammonia (Lewis base) with borane (electron deficient Lewis acid) to form a coordinate bond between nitrogen and boron. In organic chemistry there are many examples of this type of reaction. In organic reactions the Lewis base is often called a nucleophile (it seeks positively charged atoms), the Lewis acid is termed an electrophile (it seeks electrons), and the product is called an adduct. Coordinate bonding can also be found in coordination complexes involving metal ions, especially if they are transition metal ions. In these complexes Lewis bases in solution donate their free pairs of electrons to the metal ion, which acts as a Lewis acid and accepts the electrons. Coordinate bonds form and the resulting compound is called a coordination complex, while the electron donors are called ligands. There are many chemicals with atoms that have lone pairs of electrons. Such compounds often contain atoms of oxygen, sulfur, nitrogen, and halogens or halide ions, which, in solution, can donate their electron pairs to become ligands. A common ligand is water (H2O), which will form coordination complexes with any hydrated metal ions, like Cu2+, which will form [Cu(H2O)6]2+ in aqueous solution. Other common simple ligands are ammonia (NH3), fluoride ions (F-), chloride ions (Cl-), and cyanide ions (CN-). The traditional picture of the metallic bond was developed soon after the discovery of the electron. In this picture the valence electrons were viewed as an electron-gas permeating the crystal lattice structure of the metal atoms. The cohesive forces holding the metal together could be qualitatively seen as resulting from the electrostatic interaction of the positively charged metal atom cores with the negatively charged electron-gas. With the development of quantum mechanics this picture has changed significantly. Quantum mechanically covalent bonding can be described by constructing molecular orbitals from a linear combination of atomic orbitals (LCAO theory). For some molecules, such as benzene, which contain resonance in an extended conjugated system, some of the molecular orbitals are delocalized and the electrons not fixed between particular atoms. Applying these concepts to metals leads to the Band theory of solids. In this theory the metallic bond is similar to the delocalized molecular orbitals of benzene, but on a much larger scale and with the bonding spread throughout the metal. A good example is a sodium atom. It has one valence electron in an s orbital. When we add another atom the overlap of the two s orbitals results in two molecular orbitals of differing energies. Adding a third atom results in three molecular orbitals and so on. In a small lump of sodium there are many thousands of atoms and consequently many thousands of molecular orbitals whose energies lie close together. This results in an energy band populated by the available electrons that is called the s-band. Similarly, with other atoms, one can also get a p-band from the overlap of atomic p orbitals. In insulators there is a large energy difference between different bands called a band gap. In semicondutors this band gap is smaller and is what gives semiconductors their useful properties exploited in electronic circuits. Hydrogen bonds between water molecules are diagramatically represented by the black lines. 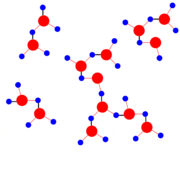 The red lines are covalent bonds that hold oxygen (red) and hydrogen (blue) atoms together in the water molecules. In chemistry, a hydrogen bond is a type of attractive intermolecular force that exists between a hydrogen atom on one molecule and an electronegative atom such as [nitrogen]], oxygen, or fluorine, on another. Although stronger than most other intermolecular forces, the typical hydrogen bond is much weaker than both the ionic bond and the covalent bond. Within macromolecules such as proteins and nucleic acids, hydrogen bonds can occur between two parts of the same molecule, and are important in maintaining the biological activity of the molecule. As the name "hydrogen bond" implies, one part of the bond involves a hydrogen atom, which is covalently bonded to a strongly electronegative heteroatom (typically, nitrogen, oxygen, sulfur, phosphorus, boron, chlorine, bromine, iodine, or fluorine). This results in a strongly polar bond in which the hydrogen bears a partial positive charge. Since hydrogen is relatively small compared to other atoms and molecules, the resulting charge represents a large charge density. A hydrogen bond results when this partial positive charge on the hydrogen is attracted to a lone pair of electrons on another heteroatom which bears a partial negative charge. The hydrogen bond is not like a simple attraction between point charges. Since it involves a lone pair of electrons on the heteroatom there is some degree of orientational preference, and the interaction has some of the characteristics of a covalent bond. Strong covalency in a hydrogen bond raises the questions: "To which molecule or atom does the hydrogen nucleus belong?" and "Which should be labeled 'donor' and which 'acceptor’?" According to chemical convention, the donor generally is that atom to which, on separation of donor and acceptor, the retention of the hydrogen nucleus (or proton) would cause no increase in the atom's positive charge. The acceptor meanwhile is the atom or molecule that would become more positive by retaining the positively charged proton. Liquids that display hydrogen bonding are called associated liquids. Hydrogen bonds can vary in strength from very weak (1-2 kJ mol−1) to so strong (40 kJ mol−1) as to be indistinguishable from a covalent bond, as in the ion HF2−. The length of hydrogen bonds depends on bond strength, temperature, and pressure. The typical length of a hydrogen bond in water is 1.97 Å. The most ubiquitous, and perhaps simplest, example of a hydrogen bond is found between water molecules. Each water molecule comprises two hydrogen atoms and one oxygen atom. A hydrogen bond can form between the hydrogen of one water molecule and the oxygen in another. Each water molecule comprises not only two hydrogen atoms but also two lone pairs of electrons from the oxygen. Thus each water molecule has the potential to form four hydrogen bonds altogether; two through the hydrogen atoms to oxygen in other molecules, and two through the lone pairs to hydrogen in other molecules. The geometry of the resulting structure is tetrahedral, not unlike the tetrahedral structure of diamond. Water's distinctive physical properties result from this pattern of hydrogen bonding. Both its boiling point and its melting point are unusually high; its surface tension is strong; and in its frozen form, ice, it is less dense than in its liquid water form. In ice, the crystalline lattice is dominated by a the regular tetrahedral array of hydrogen bonds which space the water molecules farther apart than they are in liquid water. This accounts for water's decrease in density upon freezing. In other words, the presence of hydrogen bonds enables ice to float, because this spacing causes ice to be less dense than liquid water. If the hydrogen bond between water molecules were comparable in strength to the hydrogen-oxygen covalent bond within water molecules, one might find the atoms of two interacting water molecules partitioned into two polyatomic ions of opposite charge, specifically hydroxide (OH) and hydronium. (Hydronium ions are also known as "hydroxonium" ions). Indeed, in pure water under conditions of standard temperature and pressure on average about one in every 5.5 * 108 molecules gives up a proton to another water molecule, in accordance with the value of the dissociation constant for water under such conditions. Hydrogen bonding also plays an important role in determining the three-dimensional structures adopted by proteins and nucleic acids. In proteins hydrogen bonding between different parts of the same macromolecule cause it to maintain a specific shape, which helps determine the molecule's physiological or biochemical role. Hydrogen bonds form between the backbone oxygens and amide hydrogens. When the spacing of the amino acid residues participating in a hydrogen bond occurs regularly between positions i and i + 4, an alpha helix is formed. When the spacing is less, between positions i and i + 3, then a 310 helix is formed. When two strands are joined by hydrogen bonds involving alternating residues on each participating strand, a beta sheet is formed. (See also protein folding). When a protein is denatured the shape, and biological activity, is lost when the hydrogen bonds are disrupted. This can occur with heat, acids, or heavy metals. In some cases the denaturing is reversible, in others it is not. In DNA, the double helical structure is due largely to hydrogen bonding between the base pairs, which link one complementary strand to the other. Hydrogen bonding similarly also enables DNA replication and transcription. The hydrogen bond remains a fairly mysterious object in the theoretical study of quantum chemistry and physics. Most generally, the hydrogen bond can be viewed as a metric-dependent electrostatic scalar field between two or more intermolecular bonds. This is slightly different than the intramolecular bound states of, for example, covalent or ionic bonds; however, hydrogen bonding is generally still a bound state phenomenon, since the interaction energy has a net negative sum. The question of the relationship between the covalent bond and the hydrogen bond remains largely unsettled, though the initial theory proposed by Linus Pauling suggests that the hydrogen bond has a partial covalent nature. While a lot of experimental data has been recovered for hydrogen bonds in water, for example, that provide good resolution on the scale of intermolecular distances and molecular thermodynamics, the kinetic and dynamical properties of the hydrogen bond in dynamical systems remains largely mysterious. Locke, W. 1997. Introduction to Molecular Orbital Theory. Retrieved May 18, 2005. Nave, Carl R. 2005. HyperPhysics. Retrieved May 18, 2005. Covalent Bonds and Molecular Structure. This page was last modified on 8 February 2017, at 15:14.